In this specific instance, we're going to take a look at the award for Best Limited Comic Series in 2018, and there were a ton of great books to choose from. Earlier this month, we narrowed the enormous field down to five series that would vie for the award: Coda, Cosmic Ghost Rider, Mister Miracle, The Seeds, and X-Men: Grand Design. While all of these titles are certainly deserving of the title, there can only be one winner. Cosmic Ghost Rider, written by Donny Cates, illustrated by Dylan Burnett, and published by Marvel Comics! Donny Cates has quickly become a household name in comics over the last year or so, with several Marvel books making a massive splash with both fans and critics. 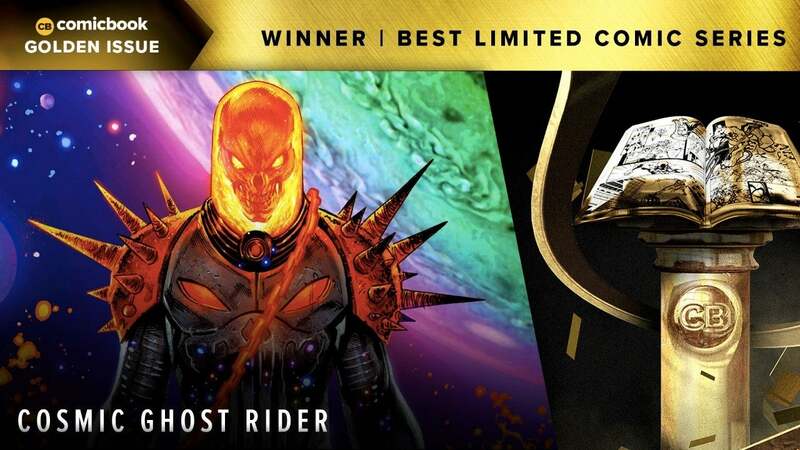 Titles like Venom and Thanos have been highly celebrated, and for good reason, but none of Cates' other projects have been quite as bold as Cosmic Ghost Rider. Along with frequent collaborator Geoff Shaw, Cates created the Cosmic Ghost Rider during their celebrated Thanos run. The character is a distant future version of Frank Castle who has made deals with several different evil forces, ultimately acting as an aide to the Mad Titan himself. Cosmic Ghost Rider picks up after the events of Thanos. Frank died at the end of the previous series, and he was somehow sent to Valhalla. Knowing he didn't belong there, Frank had Odin send him back to reality, but he didn't choose to go back to where he left off. Instead, Frank was sent to the birth of Thanos, where he planned on killing the Mad Titan as an infant, stopping the villain's evil from ever reaching the universe. As we all know, there is a heart hiding underneath that Punisher logo, and Frank decided he couldn't go through with it. Instead, the Cosmic Ghost Rider kidnapped Baby Thanos and tried to teach him not to be evil. Not only was this book just a ton of wacky, unexpected fun, but it also contained a surprising amount of heart and depth. Frank had to come to terms with his past, accepting that there are certain things he will never be able to make right, and trying his best to change the future for the better. Cosmis Ghost Rider is one of the more unique comics published by Marvel in recent years, and it's definitely worth checking out if you haven't already. Be sure to return to ComicBook.com to see the rest of this year's award winners as they are announced throughout the week, and be sure to share your own favorites with us on social media.